Happy Friday everyone! 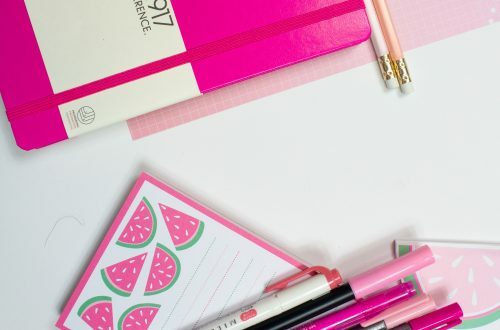 I’m so excited to be sharing today’s blog post with you! I have a huge passion for sustainable products in my life and creating a more eco friendly way of living. I just love finding brands that share my same passion. In fact, I’m an Eco Rep at my college! 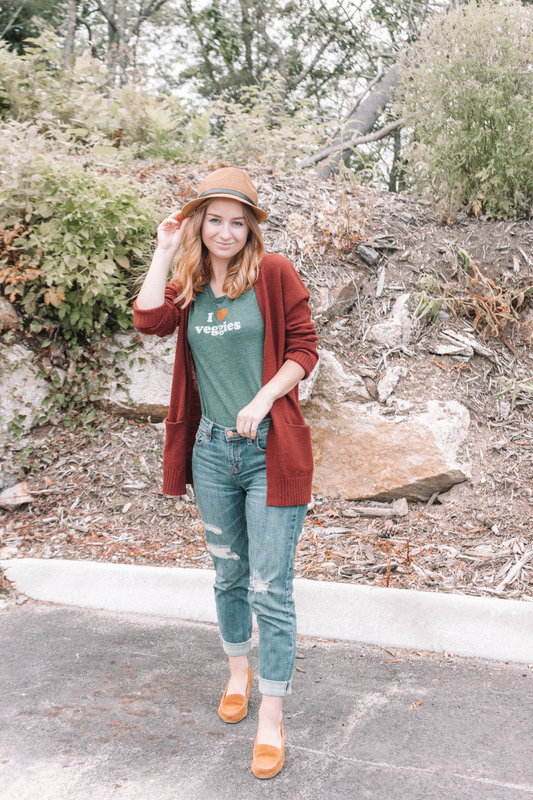 You guys have heard me talk about my favorite eco friendly cleaning products, but I also love sustainable clothing! 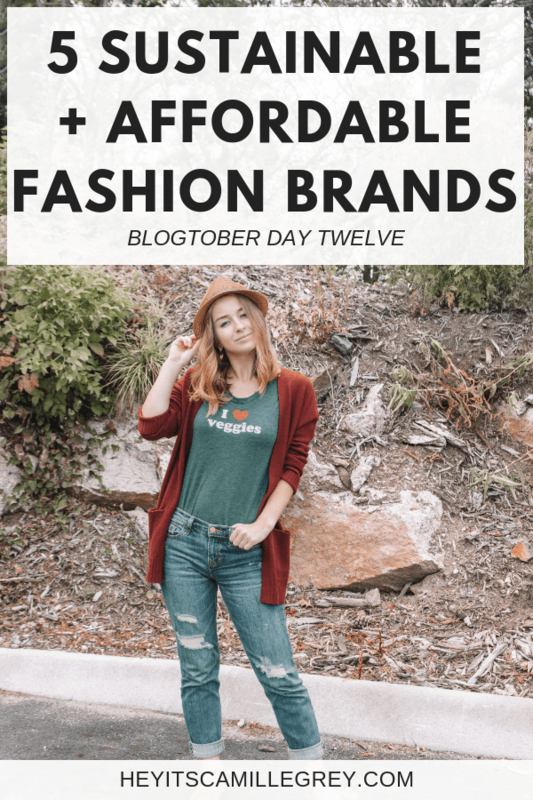 For Blogtober Day Twelve, I’m sharing five sustainable fashion brands! I hope that this list helps inspire you to grow your closet in a sustainable way! A lot of sustainable brands are “slow fashion” which means that their prices are a bit more expensive than a typical “fast fashion” store. I created this list to help show that it can still be affordable to have a more sustainable closet! I’m by no means a perfect example of sustainable fashion, but every little bit helps! I tried leaving any sort of coupons or referral links to help you save even more money! In these photos I’m wearing a shirt from the brand Locally Grown Clothing! I just love the message of it! It’s definitely a conversation starter and I always get so many compliments when I wear it. It’s a great way to introduce others into sustainable clothing brands! I first found out about Locally Grown Clothing at a farmer’s market in San Diego. I just loved the print of the shirt and I knew it was more eco friendly. While it was a bit more pricey than I normally spend on shirts, but the quality is just amazing. They are about $30 bucks, so still affordable! 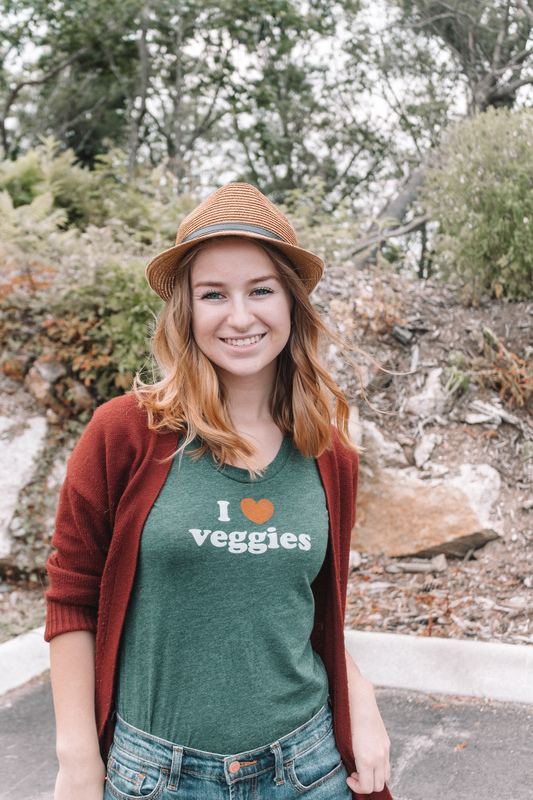 The shirts promote messages about eating/drinking locally, but it also shows brings awareness about where our clothing comes from. The shirts are organic, eco friendly, hand printed and made here in the US! They sell shirts for women, men and kids and also accessories! I love this Locally Grown shirt and this Maine one! 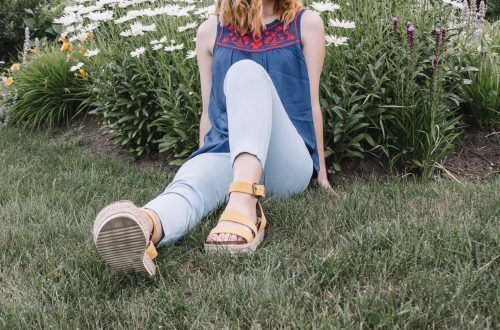 Now I’m sure you’ve heard of thredUP before. It’s biggest online secondhand store. It’s a great way to shop second hand within any kind of budget. The items can be gently used to brand new with tags. You’re able to shop by size, brand, colors etc. They sell basically everything you would find at any consignment shop such as clothing, shoes, bags, etc. If you use the code WELCOME20 on your first order, you’ll get $20 off your first order! I’ve just recently heard of PACT and I am in love! Their prices range from about $10-70. Their products are fair trade and organic! If you want to use my referral link, you’ll get 20% off your first purchase! October is fair trade month, so they are also giving free shipping for the entire month! They sell all different types of apparel for women, men and kids. I have my eye on this sweater and these joggers! Oh my goodness, what an awesome brand! Here is their story, now why aren’t more brands like this?? They are a athletic brand that ranges from $28-70. Their workout gear is made from recycled plastic! From start to finish, the clothes are ethically made and sold. I am loving these leggings in citrine and this tank in pebble! All orders with leggings have free shipping! This brand name stands for Leave Nothing But Footprints. I love that name! This brand is all about the casual wear! They sell women and men apparel and some home items too! The prices range from $34-99. Their home products, like sheets, range a bit more pricey but look so comfy! The products are organic, sustainably and ethically made by using resources such as bamboo! I’m loving their lounge dress and this turtleneck in olive! There is free shipping on orders $150 and up! Check out my Blogtober Day Eleven post here! Let me know if you guys have shopped from these brands before. Would you try any of these items?